1  and the posted letter? 4  of Fair Employment and Housing. 5 		THE COURT: Go ahead. 11 and Housing, were those letters mailed to you? 16 	A. On the back of this one. 17 	Q. The one you received, on the back turn it over. 18 	A. The number down below. 19 	Q. On the back. 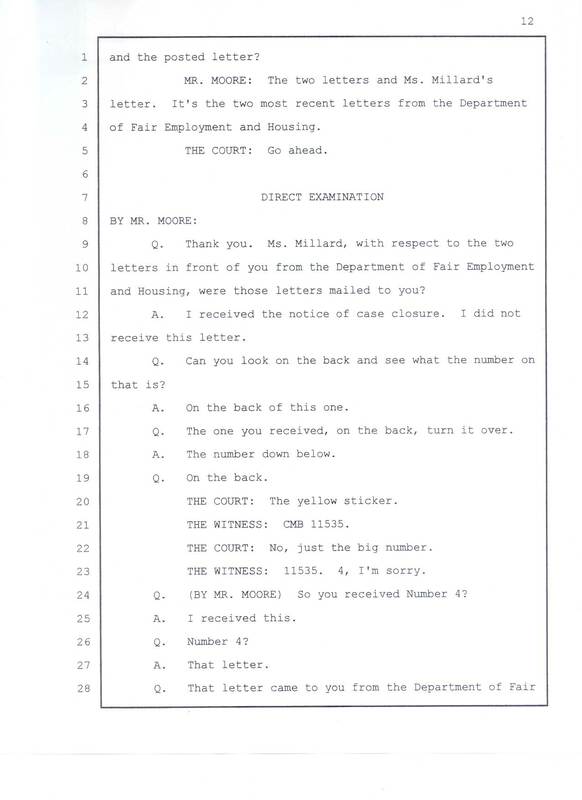 20 		THE COURT: The yellow sticker. 21 		THE WITNESS: CMB 11535. 22 		THE COURT: No, just the big number. 23 		THE WITNESS: 11535. 4, I'm sorry. 24 	Q. (BY MR. MOORE) So you received Number 4? 25 	A. 	I received this.